Truly it is the simple things that can make the biggest difference. It took me all these years to figure out a sure fire way to unmold a tart in a tart pan with removable bottom when it sticks to the bottom. I wasn't happy with heating a towel under hot tap water and wringing it out before applying it to the pan bottom as it never stayed hot enough for more than a few seconds and I was also concerned by the risk of moisture creeping into the bottom crust. One day during our step-by-step photo shoot, it suddenly hit me how to heat the bottom of the pan effectively without turning the tart upside down! I've added this simple technique to the upcoming Baking Basics but can't bear to make you wait for almost two years to know it, especially with all that holiday baking coming up. So here it is right now: Heat the bottom of a 9 inch cake pan by filling it with very hot water. Let it sit for several seconds until the pan feels hot. Empty the water and invert the pan onto a counter. 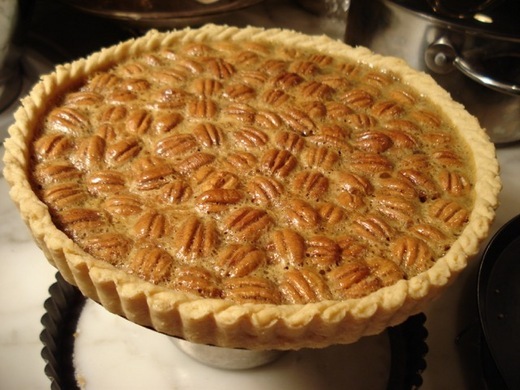 Set the tart on top and let it sit for about 1 minute or until the bottom no longer feels cold. Repeat if necessary. You can also use a blow dryer to heat the inverted cake pan. If necessary, slide a thin-bladed knife or long metal spatula under the crust to release it. >Recently, I learned a great tip from my cousin's wife Vicki who comes from Australia and now lives a mere hour away from us. We were talking about the famed Pavlova--a fabulous crisp meringue shell with marshmallowy interior, filled with whipped cream and fresh fruit. Woody and I had made numerous tests to perfect the consistency of the meringue for our upcoming Rose's Baking Basics book. 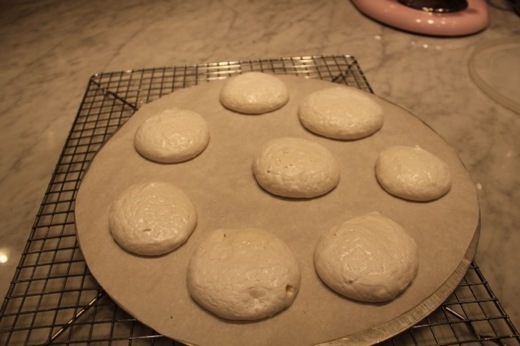 I've always baked my meringues by piping or spreading them on parchment, which effectively prevents sticking. Vicki, however, said that she instead dusts the pan with cornstarch and the meringues slide off with ease. Of course I just had to try this immediately with the always tricky/sticky piped meringue baked in a pie plate, featured in The Baking BIble for the "Pomegranate Chiffon Pie." Prior to Vicki's suggestion, I had recommended coating the pie plate with vegetable shortening and then dusting with Wondra flour. It was always difficult to remove the first piece, and not that much easier to achieve attractive slices. 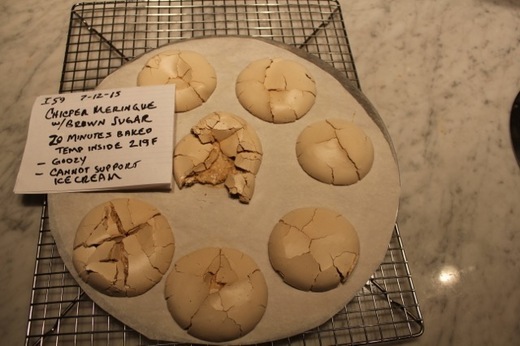 (Note: meringue does crumble when cut.) My first test was using cornstarch instead of flour and the meringue still stuck. I suspected that the shortening did not coat evenly so the next test was coating the pie plate with non-stick cooking spray and then dusting it with cornstarch. This test proved to be the charm. 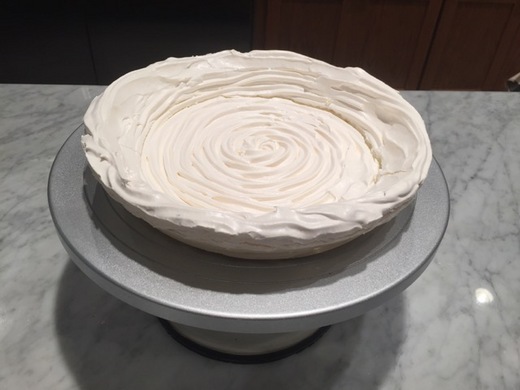 I waited impatiently for the meringue to cool completely and then dislodged the very top edge along the rim with the tip of a small knife. I hesitatingly nudged the meringue forward slightly and, to my great joy, it moved. 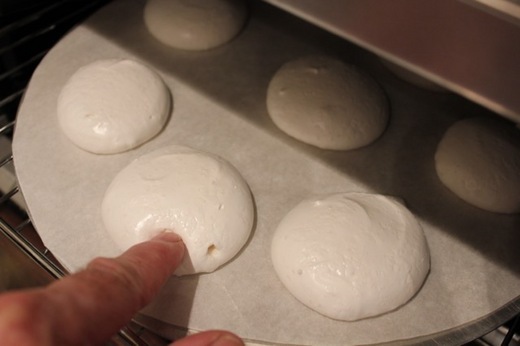 Holding my breath, with my fingers, I then lifted out the entire meringue shell onto a plate. I gazed at this wondrous sight, but it didn't take more than a few minutes to start wondering how it would work with just the non-stick cooking spray and no cornstarch. I coated the pie plate with non-stick cooking spray and removed excess with a paper towel. 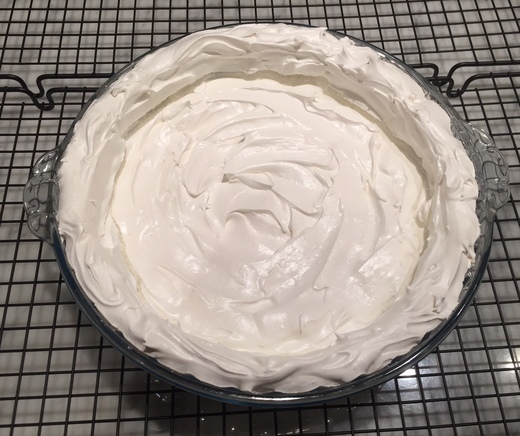 Instead of piping the meringue, I just spread an even layer into the pie plate. Without the cornstarch it was more difficult to spread the meringue. At the same time and temperature (and the day was actually less humid) the meringue was still a little gooey in places so I returned it to the oven because meringue will not unmold in one piece if not completely dry. It stuck in places even when completely dry, which indicated that the cornstarch is necessary. Conclusions: Piping the meringue makes it easier to make it consistent in thickness but spreading it looks just as good. 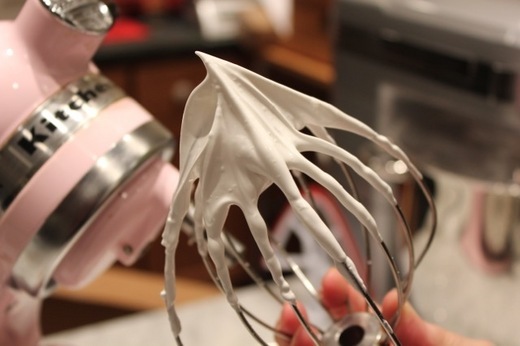 Non-stick cooking spray plus cornstarch is ideal and makes it possible to unmold the meringue. 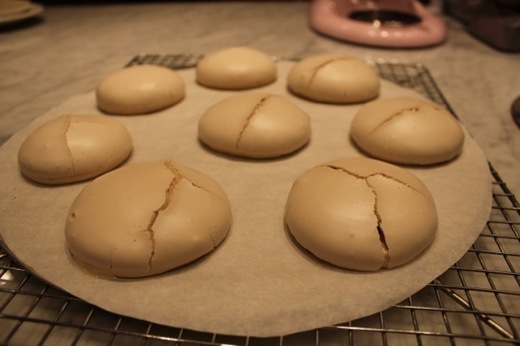 Non-stick cooking spray alone is slippery, which makes it harder to spread the meringue, and will not be possible to unmold in one piece. 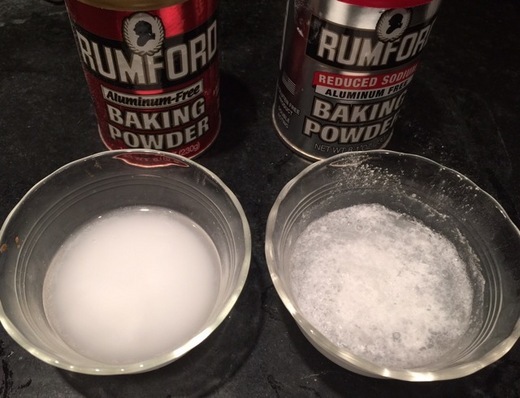 With or without cornstarch, non-stick cooking spray makes removing the slices much easier than shortening and flour. No two ovens bake exactly the same. All ovens, except for those with circulating trays, will have some hot spots. Convection ovens tend to bake more evenly but still have hot spots. 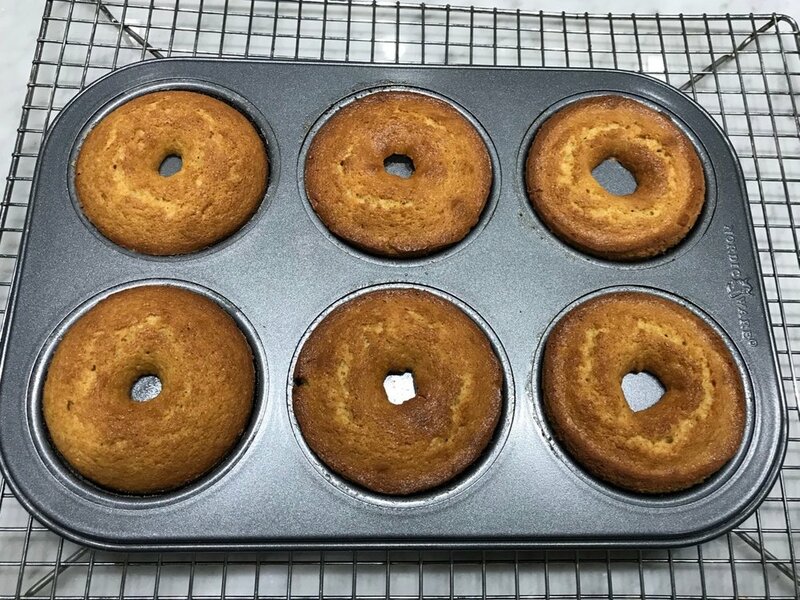 I rotate my cakes half-way around after two-thirds of the estimate baking time except if they are sponge type cakes such as génoise or chiffon that will fall if moved before they finish baking. In the Breville, if a recipe calls for 350°F/175°C I use 340°F/170°C. 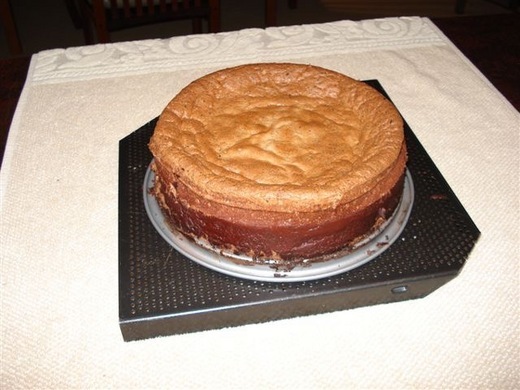 In the Panasonic, if it's a small cake or a pie I don't lower the temperature but for a large cake that requires more than 1 hour of baking time, such as a honey cake, which starts browning too fast, I lower the temperature to 325°F/160°C after the first 30 to 45 minutes of baking. 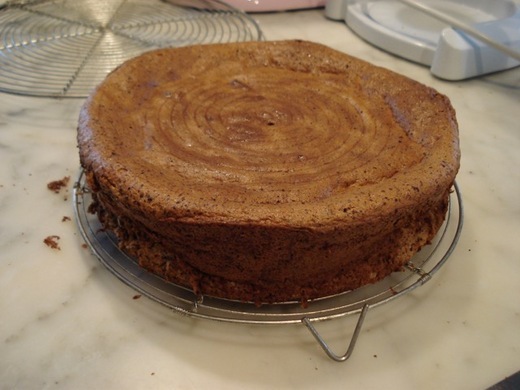 When you get a new oven, try baking a familiar cake. I use my all-occasion downy yellow cake from The Cake Bible. Get to know your oven and you can adjust accordingly. The Ins and Outs of Making Your Own Wedding CakeIf you are a home baker, chef, or especially a pastry chef, people are going to expect (or at least hope) that you will be making your own wedding cake. After having made over 100 wedding cakes, and gotten to experience first hand all the dramas surrounding a wedding, I have a few basic ideas to help keep your sanity intact and allow you to enjoy your own wedding. 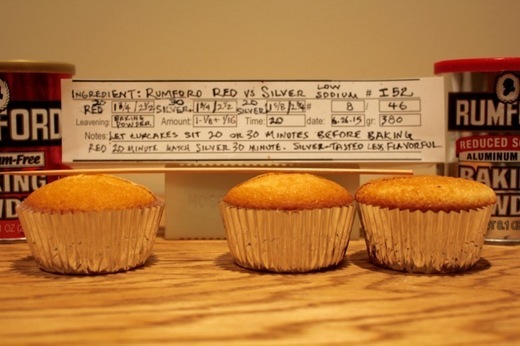 First, keep in mind that wedding cake portions are traditionally small. A three-tier cake (12 inches, 9 inches, and 6 inches will serve 150 people. If you are anticipating more guests or chose to serve larger portions, make a sheet cake in addition to the tiered cake. 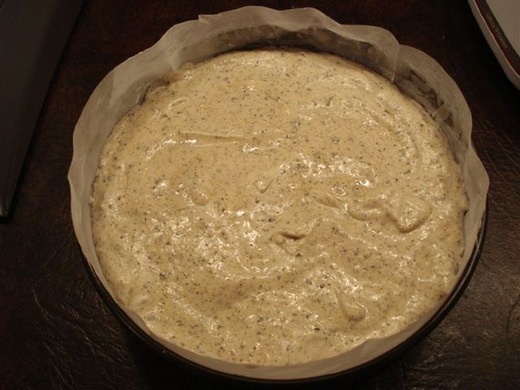 (The batter for two 12 inch layers is equal to one 18 by 12 inch sheet cake.) Tiered cakes take longer to cut and serve and since the wedding cake comes at the end of the reception, guests often leave before the entire cake is cut. A good plan is to make the cake layers ahead and freeze them. If frosting the layers before freezing, they need to be set, unwrapped, in the freezer for a few hours until frozen solid so as not to mar the decorations when wrapping. They will need to be defrosted gradually by unwrapping and setting them overnight in the refrigerator, to avoid condensation. Be sure to use a refrigerator that is odor free as butter and or chocolate absorbs aromas readily. If freezing the layers unfrosted, wrap them well in several layers of plastic wrap. It is also helpful to set the wrapped cakes in freezer weight zip seal bags. 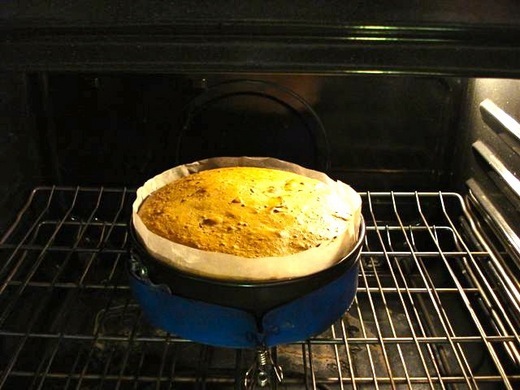 You want to keep the cake from drying or absorbing any odors in the freezer. If you choose to have a traditional white (or ivory, assuming and hoping you are using butter!) 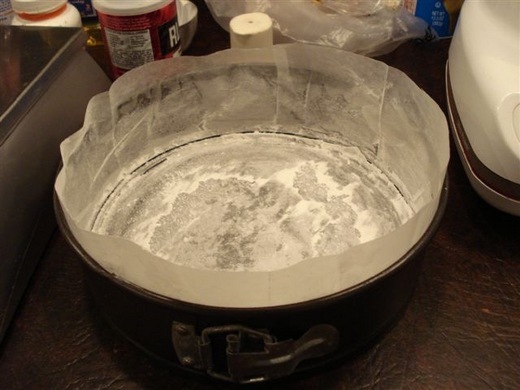 the best choice of covering the cake, if not using fondant, is mousseline. 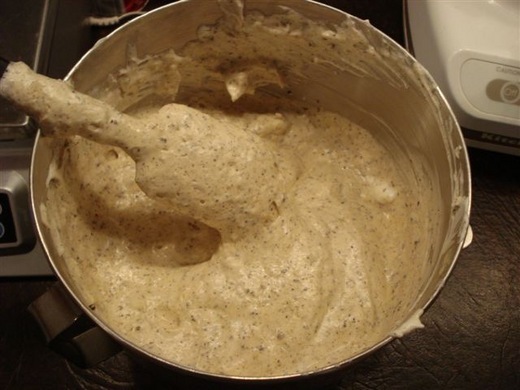 At relatively warm temperatures it holds up well, and even at excessively high temperatures, should it melt, it is so beautifully emulsified it forms an elegant sauce. 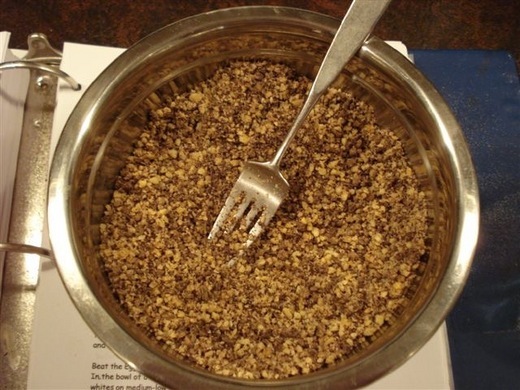 (See base recipe below. 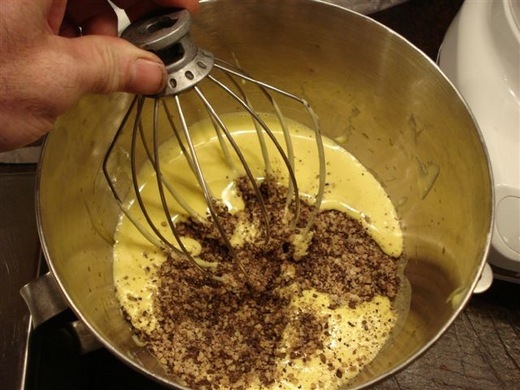 You can add different flavorings such as colorless liquors. 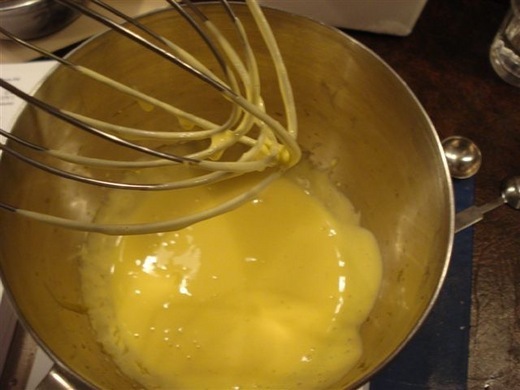 Fruit purees, lemon curd, or cooled melted chocolate will tint the mousseline so best used as the filling between the layers.) If traveling with a tier cake it is highly advisable to stake the tiers. Drive a 3/8 inch wooden dowel, sharpened at one end, through the tiered cake layers to keep them from sliding. Choose a dowel that is about 6 inches longer than the height of the finished cake for ease in removal. Before frosting each cake layer, it is a good idea to cut two 1 inch long slits in the center of each cardboard base to form an X before placing the cake layers on top. This will enable the dowel to penetrate through the cardboard without risk of compressing the cake. No need to make the cuts on the cardboard supporting the bottom tier. Use a hammer, tapping gently, to drive the dowel through to the bottom of the cake. When the cake is ready to be displayed, remove the dowel by twisting and pulling it up and out of the cake. Frost or place an ornament on top of the cake to hide the small hole. Alternatively, you can use a 3/16 inch decoratively covered wooden cake base and a 1/2 inch dowel attached to its center with a flat head screw (similar to a sheet rock screw). Be sure first to make a hole in the dowel slightly smaller than the screw to prevent the dowel from splitting. 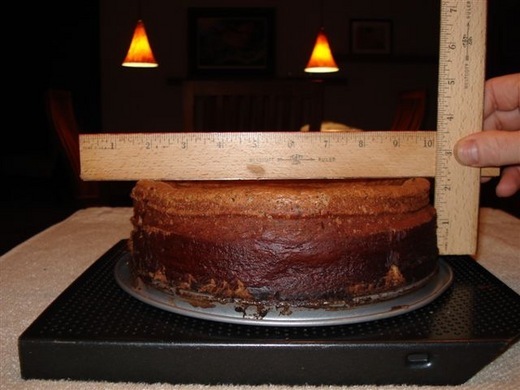 The dowel must be shorter than the height of the completed cake. Also drill a slightly larger than 1/2 inch hole in the center of each cardboard base before placing the cake layer on top. When ready to tier the cake, lift the layer supporting it with the palms of your hands. Line up the center hole with the top of the dowel and carefully slip the layer down to the base or layer beneath it. 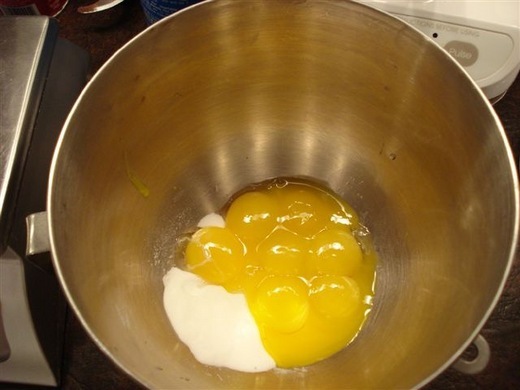 To prevent marring the frosting, when the cake layer gets almost to the base or layer beneath it, remove your hands and allow it to drop gently into place. This is an invaluable bit of kitchen wisdom imparted to me by the late Carl Sontheimer of the original Cuisinart food processor. He once told me that adding powdered milk to mixtures such as marzipan results in a more velvety smoothness. I've since noticed the presence of dry milk on the labels of many ingredients. And recently I tried adding it to yogurt to see if it would soften the intensity of the lactic acid. I was amazed how just a small amount of the dry milk powder made the yogurt creamier and deliciously mellow.One of the important uses of dry milk I value the most is its addition to bread dough. I've experimented with "instant" dry milk and King Arthur's "Baker's Special Dry Milk. Their dry milk not only adds a smoother and more mellow flavor, it also results in a more tender texture and a significantly higher rise. Unlike "instant" dry milk, which is intended to be reconstituted and processed at low heat, the "Baker's Special Dry Milk" is heated during production to a high enough temperature to deactivate the enzyme protease, which impairs yeast production and, what is most critical, gluten formation and structure. This variety of dry milk will not reconstitute in liquid so it must be added to the flour. 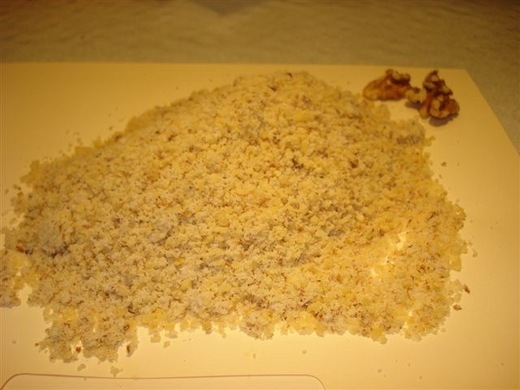 The high heat process also produces an exceptionally fine powder, which disperses uniformly through the dry ingredients. Because the particles are so much finer than the more crystalline ones of "instant dry milk," they pack down when measuring in a cup so if replacing "Baker's Special Dry Milk" with "instant" dry milk by volume you will need double the amount to arrive at the same weight. To substitute it for regular milk in recipes, use 1/4 cup of "Baker's Special Dry Milk" or 1/2 cup "instant" dry milk (1.4 ounces/40 grams) plus 1 cup/8.3 ml/8.3 ounces/237 grams of water per cup of milk. Up to 8.2 percent of the weight of the flour is the recommended amount; I use 6 percent in my soft white sandwich loaves. Melting Chocolate EffortlesslyWhen melting a large block of dark chocolate, such as a 2-1/2 kilo/5.5 pound block, there's a much easier way to do it than chopping it first into small pieces with a chef's knife. The only draw back is that it will take several hours so I like to do it the night before. Simply place the chocolate in a pan and set it in an oven with a pilot light or oven light. Be sure to put a note on the oven door so that someone doesn't come along and turn up the oven! About four hours later the chocolate will have melted into an even liquid pool of shiny chocolate. Chocolate should not exceed 122˚F/50˚C. At higher temperatures it will lose flavor. So be sure that your oven's pilot light does not register higher. 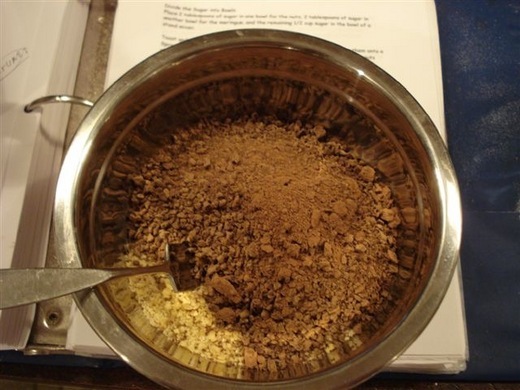 This method works only for dark chocolate as chocolate containing milk solids requires frequent stirring to prevent seeding. Tip for accentuating the flavor of chocolate: Many ingredients enhance the flavor of chocolate. 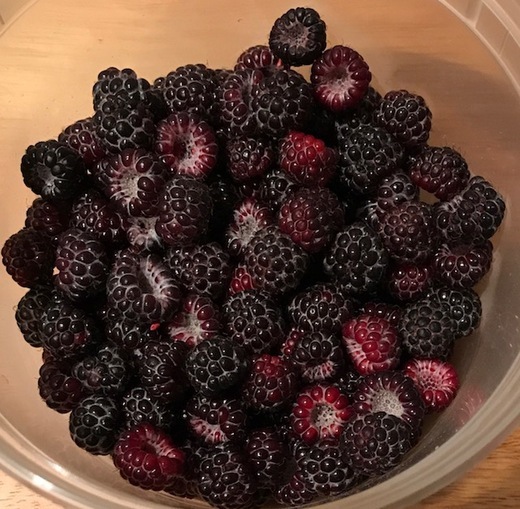 Coffee, raspberry, walnuts, for example, are known to be synergistic additions. But have you tried malt powder? 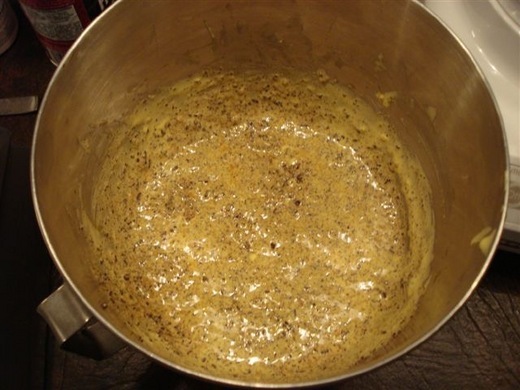 Start by adding about 1.5% malt to the mixture. Ideally you should not be able to distinguish the flavor of malt but rather to achieve a more intense yet mellow chocolate flavor. Cakes baked in fluted tube pans form their own beautiful decoration and often require nothing more than a dusting of powdered sugar or cocoa if that. However, if the pan is not prepared properly, the cake will not release well and some of the lovely decorative parts will be stuck to the pan.I have found only one supermarket product that works to give a full release to the cake and that is Baker's Joy, which contains flour and lecithin. Other products simply don't work nearly as well. 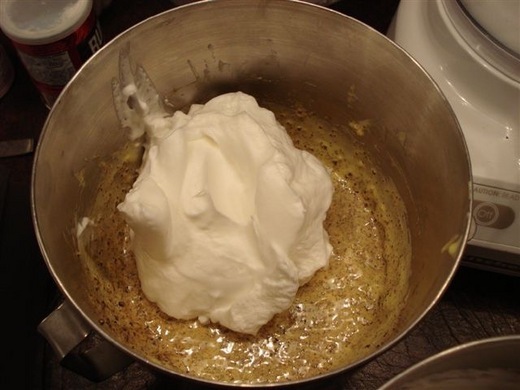 Pam cooking spray is excellent for other uses but for baking, the Pam with flour and lecithin for some reason does not release well and, to my taste, it imparts an unpleasant taste to the cake. The best way to coat the pan, using Baker's Joy, is to use an even spray and then to brush out any excess to avoid air bubbles. Also wipe the top edge of the pan with a paper towel to keep the pan clean during baking. If you can't find Baker's Joy, the best substitute is solid vegetable shortening and flour, preferably Wondra flour, but any will do. Use a brush for the shortening to make sure you reach all the nooks and crannys. Then add some flour and tap and rotate the pan to coat evenly. Invert the pan and tap out any excess flour. 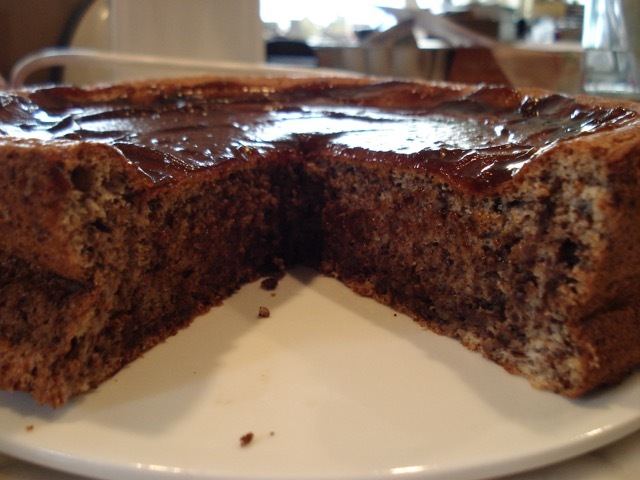 If you like a high shine on the cake's surface, here's a great tip from the late Rich Hecomovich who worked for Nordicware: Set the pan in a 325°F/160°C for 1 to 3 minutes until warm. If the pan is hot, allow it to cool just until warm. Coat the inside of the pan with Baker's Joy. Then take a small pastry brush and brush the spray into all the groves. (The warm pan will melt and thin out the spray.) Flip the pan upside down on a paper towel to let the excess coating drain out (1 to 3 minutes). 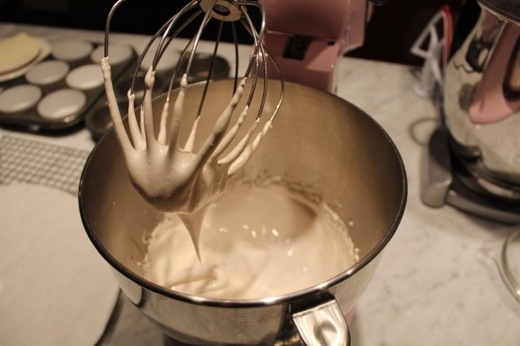 Invert the pan and slowly pour in the batter. 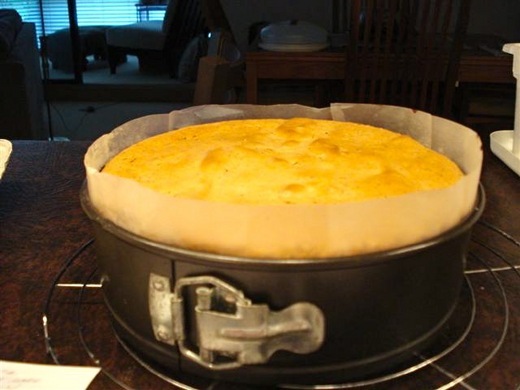 Set a towel on the counter to buffer the pan and knock the pan on the counter a few times to make the air bubbles/pockets in the batter pull away from the outside of the batter so that the sides of the baked cake will be smooth. 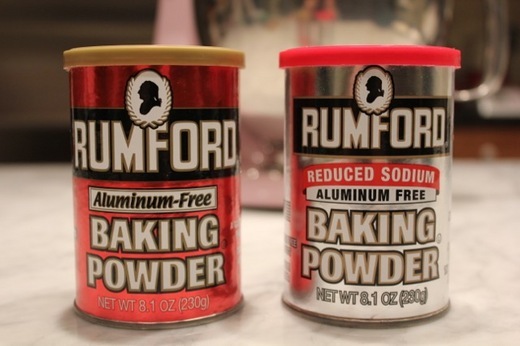 And another great tip, from Liz Duffy who was the food stylist for Rose's Heavenly Cakes: To eliminate air bubbles in the surface of the cake, for butter or oil cake recipes: first add a small amount of batter to fill the bottom of the pan, and using the back of a large spoon or spatula, press the batter into the pan's flutings at the bottom. Now here's a tip from me: If you prefer to use unbleached flour, tube pans are perfect to prevent the usual dip in the center. Why? because there is no center! Here is the link to my latest article for Food Arts Magazine. The subject is Why Weigh!